Thanks for visiting our Cooper City-Southwest Ranches-Miramar area Invisalign information page. We proudly serve these three cities, and we are also conveniently located for people that could benefit from Invisalign in Pembroke Pines and Davie, Florida. Our family dentistry practice is led by a pair of extraordinary doctors, and they are always on the cutting edge of new orthodontic procedures like Invisalign. Traditionally, when a person came into a dentist for a teeth straightening solution, cumbersome metal braces would be the only option. While the long-term outcome would usually be positive, there were many drawbacks for the patients. The appearance factor may be at the top of the list. There is no getting around the fact that braces are not going to do much to enhance your smile. To exacerbate this situation, many people that wear braces are younger, and they are more prone to embarrassment in social situations. Fortunately, an innovation came along in the form of Invisalign. Miramar, Davie, and Southwest Ranches area patients no longer have to worry about the negative visual impact. As the name would imply, Invisalign straightens teeth, but the aligner is crystal clear and invisible. The aligners are computer-generated from a mold, so they are custom crafted and unique for each patient. Since the position of your teeth will continually shift as they get straighter, a new tray is fashioned every two weeks. In addition to the cosmetic benefit, the little things in life are much easier for Pembroke Pines-Cooper City area people that use Invisalign to straighten their teeth. You can remove the aligners when you are eating, drinking, flossing, and brushing your teeth. This is not possible if you wear metal braces, and they are subject to damage when certain types of foods are eaten. 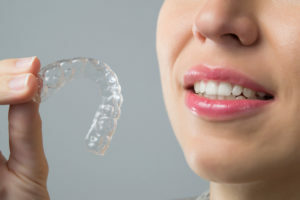 Invisalign trays are also very easy on the gums and the cheeks. With metal braces, there are sharp edges that can cause painful, irritating scrapes and cuts. When you combine all of these benefits, you can see why these state-of-the-art aligners have become so popular. If you need your teeth straightened in Miramar, Southwest Ranches, Davie, Pembroke Pines, or Cooper City, Invisalign may be the right choice. We are here to help if you would like to come in for an initial consultation, and you can request an appointment if you send us a message or give us a call at 954-589-0292.